So on my most recent business trip I went to a client with office in Jersey City. After work each day we went to Hoboken, NJ for dinner. Along Washington Street there is a host of restaurants. The first night we went to a Indian restaurant called Karma Kafe which was really good. The view from our client's offices was absolutely fantastic. I haven't put up all of my pictures yet but the one on the right should give you a good idea. Our second night once gain we headed to Hoboken but went Japanese this time around. We went to a place called Robongi, by which I can't figure out if they purposely misspelled Roppongi (六本木). Regardless the food was good and it wasn't too expensive. I think we each were charged around $28. Note, if you do go that it is BYOB if you are looking to have alcohol with your dinner. So each night we had interesting experiences with taxis to and from our hotel in Jersey City to Hoboken. Apparently they don't use their meters much or accept credit cards. On the other hand, it was always fixed price so we didn't need to worry about not having enough money. Anyway, on our last night, we got a tip from the hotel staff and jumped on the light rail to for $4.20 round trip to Hoboken. Getting off the train we walked along the waterfront. It was really nice with alot people out and about walking, jogging, just sitting and talking. The view across the Hudson is also incredible obviously with New York City being right there. Unfortunately it was really hot an humid. 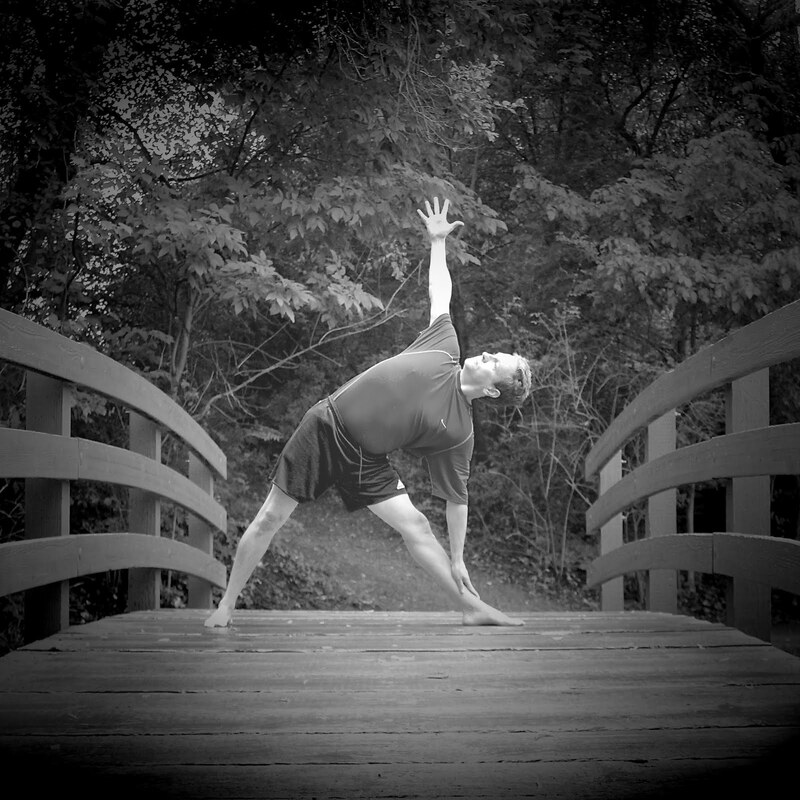 I think it was about 94 degrees and really humid. By the time we got to the restaurant the back of my shirt was soaked. 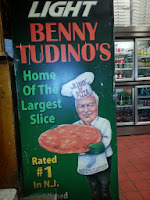 So we went to a pizza joint called Benny Tudion's. I found it on foursquare as a place where some of the sales guys from our company had been. It's tag line is "Home of the Largest Slice". And it certainly can't be far off - the pieces are huge! 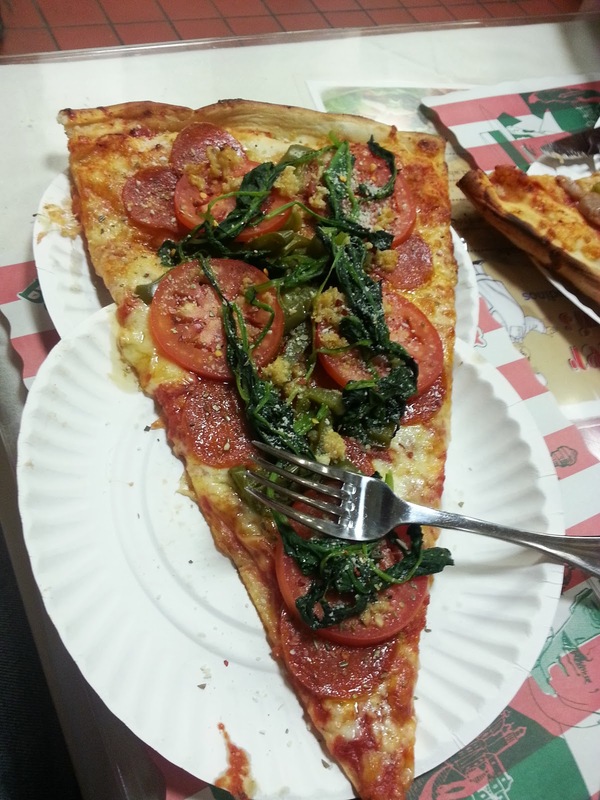 I ordered a pizza with fresh tomatoes, spinach, garlic, pepperoni, and peppers. It was really quite good and one slice was more that efficient. After the walk from the Hoboken station it was also nice to have a cool cold one - Root Beer of course. Actually we met Benny himself and he bought us a round as well. On the way back, we took a stroll once again along the waterfront as it got dark. We were there on September 11th and got to see the Freedom Tower with the spotlights shining. It was spectacular. It really was.